Folklore, located within Destination Singapore Beach Road, celebrates Singapore heritage food and the role it plays in cultural harmony in our multi-ethnic nation. Brainchild of Chef Damian D’Silva, the menu constitutes a nostalgic homage to the food he grew up with as a child of Eurasian-Peranakan parentage. 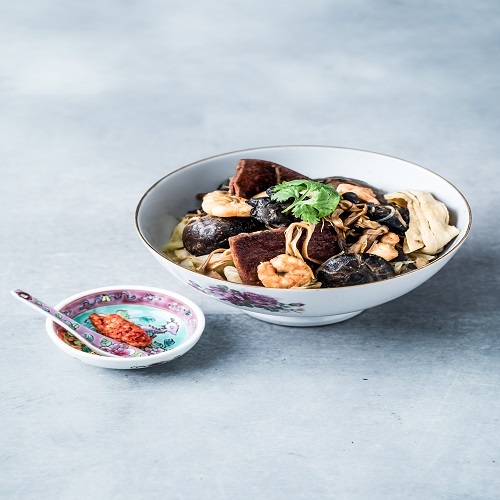 Heirloom dishes reflective of the major racial cuisines of Singapore are made from scratch, without shortcuts or compromise, using authentic – largely manual – kitchen methods and the experience is of being a guest at Chef Damian’s family dinners around the table. Signatures include Sambal Buah Keluak Fried Rice, Singgang, Hati Babi Bungkus and Beef Cheek Rendang. Higher priced item will be charged.